According to the FDA a “juice drink” is any beverage with some (but less than 100%) fruit juice that is diluted with other ingredients like added sugars. Juice drinks, soda, flavored milk, and sports drinks can destroy teeth, and lead to obesity and type 2 diabetes. All of these drinks contain added sugar, and most of the time a lot of it. It’s hard to imagine how much sugar is in a juice drink container, but with a simple math equation, you can visualize how much sugar is in any type of juice drink, soda, energy drink, sports drink—you name it. 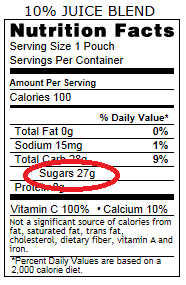 Nutrition Facts labels on beverages and other food products list the grams of sugar per serving. Remember not every drink is 1 serving! If you divide the number of grams by 4, you get approximately the amount of teaspoons in that serving. ← This juice drink contains 27g of sugar. Now looking at those sugar cubes, would you put that many into a child’s drink? 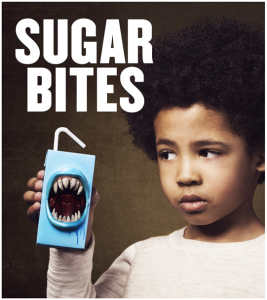 added sugar, flavored milk, juice drinks, Nutrition Facts, sports drinks, Sugar Bites, sugar sweetened beverages, tooth decay, type 2 diabetes. permalink.